Westminster Adult Education Service is one of the UK’s largest adult education providers and offers many courses free of cost. Westminster Adult Education Service is Westminster's adult college and one of the largest providers of adult education in the UK. WAES offers hundreds of qualification and general interest courses for study in the daytime, in the evening or at weekends. If you want to gain a qualification, go on to higher education, improve your skills for work, find the right training or simply learn a new hobby, we have a huge range of courses to choose from. We offer an ideal way to return to learning and to build your confidence if you were unable to complete your education, for whatever reason, even if it has been many years since you last studied. We are Westminster's only specialist adult education provider so you can expect to study with like-minded people in a friendly and relaxed atmosphere. We take education out to the community, with courses in venues across Westminster and London. Our tutors are dedicated professionals with many years' experience in both their industry and adult education. Many of our courses are FREE - and, even if you do have to pay fees, you will probably find that you pay less than at neighbouring providers. We have Learning Centres which offer study space, IT, internet and printing facilities, libraries and friendly staff to help you with your learning. Two of our Learning Centres include Apple Macs with graphic design software. We offer childcare facilities at most of our centres, allowing you to balance your learning with your family life. We offer a safe and supportive environment and atmosphere. Finally, our courses enable you to go on from first steps right through to Level 3 (Access to Higher Education), giving you the opportunity to retrain and upskill. We also offer courses for adults with learning difficulties and disabilities. Students' needs are fully assessed at enrolment and tailor-made support is offered either in class or through a series of specially designed workshops. Students who find they need extra help once they have joined their classes can request it at any time. Specialist equipment can be provided if necessary. All courses are competitively priced. The Office for Standards in Education (OFSTED) and Adult Learning Inspectorate (ALI) published in their latest inspection report that WAES provision is outstanding in Dance, Music, Fine Arts, Crafts, Design and Media and Communication. The report also identified that WAES had particular strengths in Health, Public Services and Care, Computing, Sport, Leisure and Recreation, Languages, English and Literacy and Numeracy. In the training centre at Venture House, Glasshouse Street, Piccadilly, top quality experienced trainers deliver courses to assist people to succeed in business or for personal development. Many of the courses are for personal advancement, designed to enhance knowledge and provide further understanding in a wide range of subjects. Westminster Training and Development is an enterprise of Westminster Adult Education Service, and as such, can call upon the recourses, support and experience of one of the UK's most respected Adult Education providers. WAES Learning Resource Centres at Lisson Grove, Pimlico and Amberley have Learning Centres with library resource and IT facilities available for use by all learners studying with WAES. Our Learning Resource Centres are staffed by a helpful, friendly team who are always glad to help learners. The learning support team provides study skills support to WAES learners and specialist support to students with disabilities and specific learning difficulties. The careers and education advice service offers impartial, one-to-one advice to help students make informed decisions about careers, education training and employment opportunities. WAES courses run at over 80 locations across Westminster, with our main sites in Marylebone, Piccadilly and Pimlico. All are within easy reach of public transport. It is easy to book a course at Westminster Adult Education Service. Just follow our six simple steps. Select a course: Choose a course that suits your needs, we offer everything from Art to Yoga! Check dates and availabilty online or by phone: To avoid disappointment, book early. The dates appear next to the course information. Choose your enrolment method: visit our website, call, fax, post or come in and visit us in person. Enrol online: Click here to enrol online. WAES open days are the perfect opportunity for you to try your hand at one of our courses - and the great thing is that no experience is needed to take part - just come along and have a go! Free taster sessions and seminars mean that you can try something for nothing. Whether you fancy practising music, graphics, creative arts, business or improving your employability, these short courses are all you need to steer you in the right direction for your next study. Plus, you can also get information, advice and guidance on your study options from our expert tutors. Take a tour of the modern adult college facilities of the WAES Lisson Grove Centre, see our workshops in action and be inspired to join a class. By studying English and Maths at WAES, Jennifer Ainsworth went from long-term joblessness to employment. Jennifer Ainsworth, like many of her generation, left school in the late 1970s without a qualification to her name. She drifted into the service industry, moving between temporary positions in bars and restaurants. Although she eventually settled on a job, her life took a sudden plunge when she was made redundant. 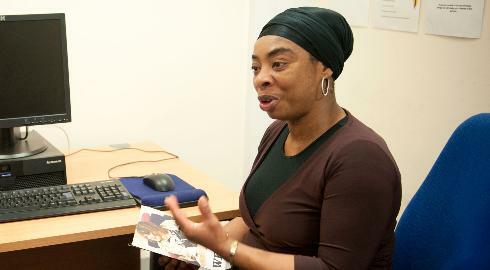 Unemployed for 10 years, it was at this point that her inspirational story really began with the help of Westminster Adult Education Service. Jennifer decided to go back and re-learn the basics. WAES was recommended to her and within two years she'd achieved high GCSE grades in written and spoken English - qualifications she'd previously thought were beyond her. "Studying at WAES gave me back my confidence," she told us. "I was given the space I needed to learn at my own pace. The teacher was kind and patient - we were treated as individuals and I felt comfortable being surrounded by people who, like me, missed the opportunity the first time around." Jennifer ignited her passion for learning and went on to complete a Business Administration degree. Now Jennifer plays an important role for Westminster City Council, helping people with learning difficulties or disabilities into employment, tackling the challenges that she once overcame. Jennifer's advice to those who find themselves in her position - "Make the most of the support and resources around. There are people and organisations like WAES out there that can help you change your life." With the help of WAES, Fardus is now running her own successful business. Fardus Aburgegha moved from Libya to London 13 years ago. Both her mother and grandmother were dressmakers, so, with such a strong family connection to clothing, fashion was an area Fardus had long been interested in but hadn't known how to make a move into. "I was sitting watching a TV programme one evening about clothes design and I thought to myself how can I do this?" So I applied and started the course at WAES. Fardus decided to study a fashion diploma at WAES and what was at first a hobby soon became a viable career choice. "The courses were reasonably priced and it was a perfect Westminster location for me. The first day at class really got me back in the mood and I started dreaming about becoming a fashion designer." After completing the diploma, Fardus opened up a business in a corner of a small shop on Harrow Road. Soon she expanded due to popular demand. Now she occupies a whole floor of the building. Her business offers a wide range of international styles, from Middle-Eastern dresses to African bespoke wear. She may be a success but Fardus hasn't forgotten her training with WAES. She still keeps her class notes and uses them as a reference. In fact, Fardus has been so passionate about her course at WAES that she's persuaded seven of her friends to sign up! "Westminster Adult Education Service is such a brilliant environment to study and the tutors are great. I'm still in contact with the some of the other students too."